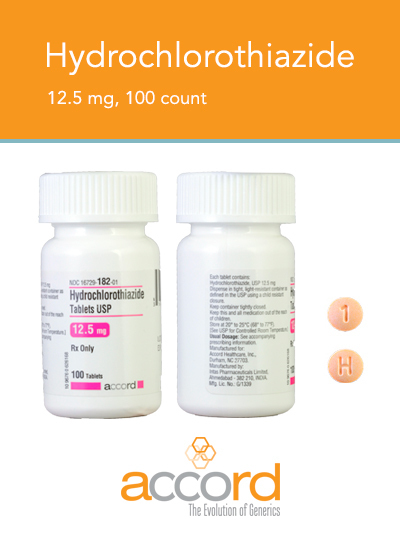 If you are in possession of Accord Hydrochlorothiazide that does not match this image or if you are unsure, please return to your pharmacy or healthcare provider for confirmation. Accord is notifying its Wholesalers, Distributors and Retailers by letter and is arranging for return of all recalled products. Wholesalers, Distributors, and Retailers that have product which is being recalled should discontinue distribution of the product and notify consumers. Consumers that have the product should return the product to the pharmacy. Consumers/Pharmacies with questions regarding this recall can contact Accord Healthcare, Inc. by phone at 1-855-869-1081, fax: 1-817-868-5362 or e-mail at rxrecalls@inmar.com Monday to Friday during business hours 8 am to 5 pm EST. Consumers should contact their physician or healthcare provider if they have experienced any problems that may be related to taking or using this drug product.